Casey’s Corner in the Magic Kingdom has been celebrating each month with a specialty hot dog and in December they’ll be offering all 12 during their 12 Days of Christmas Dogs promotion! Sounds like a delicious way to celebrate the holiday season at the Magic Kingdom! 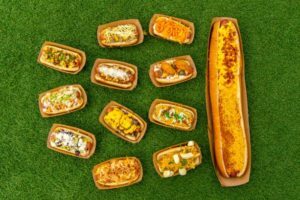 Each of these hot dogs – with the exception of the foot long hot dogs at the end of the month – will only be available for the one day they are listed.